R&S Decorative Staining has been providing top quality Fence Staining and Concrete Staining services to the Amarillo area since the spring of 2006. We have loved adding beauty and value to hundreds of Amarillo homes and businesses. 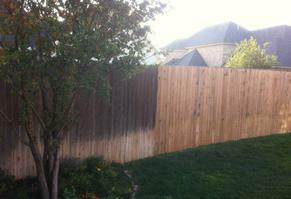 We're happy to see that you're interested in protecting either your fence and/or concrete investment. With our services your fencing and concrete will stay looking new for decades to come. And with so many color options to choose from, staining your fence and concrete can be some of the most noticeable improvements you can make to your property. Sealing these surfaces adds an incredible amount of aesthetic value to your home. Not to mention protecting them from the harsh Panhandle weather. Rest assured our professional staff will be happy to help you with any questions you might have. Our color experts can match any decor to make sure your property is the talk of the neighborhood. We offer a no mess guarantee, pride ourselves on our attention to detail and we can work around any landscaping you have being sure to protect your property.